Every June, the Lodge held its Feast Day when members assembled, initially outside the White Swan but after about 1900 the assembly point was in Lower Stonegate outside the Horse Shoe Inn. 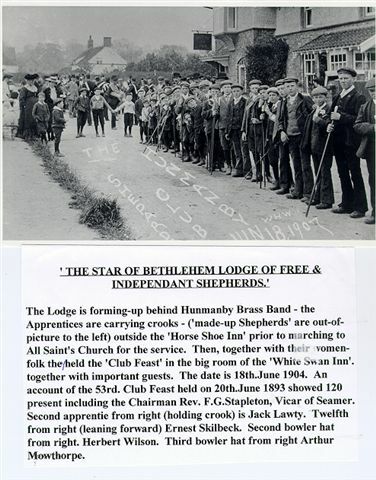 They then, preceded by the Hunmanby Brass Band, which after 1923 became the Hunmanby Silver Band, paraded up to All Saints Church, Apprentices first, followed by the Lodge in full regalia. After the church service a fine meal was provided in the Club room - known as the Club Feast - which their ladies were invited. Anticipating this, the ladies, all dressed in their Sunday best tended to follow the procession through the village. Arriving at the porch of All Saints Church the Apprentices formed up on either side making an archway with their crooks through which the Lodge members entered into the church. 20th August 1893 was the 53rd anniversary and typical of such gatherings. As recorded in Miss Owston's book:- The chairman was the Vicar of Seamer Rev.F.G. 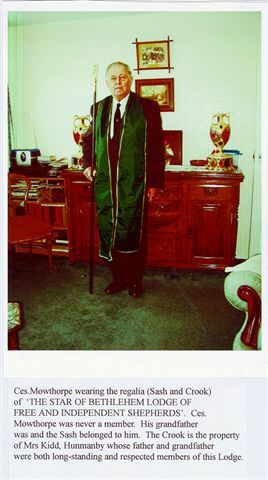 Stapleton ''who proposed the toast of Queen Victoria, the Prince and Princess of Wales and the rest of the Royal family. In his speech he detailed the outstanding events of Her Majesty's reign and the progress of the country since 1837. He alluded to the forthcoming marriage of the eldest son of the Prince of Wales with Princess Mary of Teck'' One hundred and twenty people were present. It was customary for the procession to reform in the evening and wend its way to Park House field, where sports were indulged in until darkness fell - weather permitting! With the coming of the National Health Insurance Act of 1911 these benefit clubs fell into demise. The First World War and the sale of the Hunmanby estate by Sir Denis Readhead Bayley in 1921-22 finally ended the Ancient Shepherds ceremony and Feasts although the 'Club' benefits were carried on until the late 1940's with a small committee whose last Treasurer was Jim Sharp, faithfully carrying out payments of ten shillings a week to all paid-up members when the need arose.